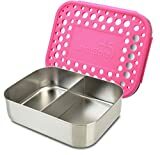 You will never know how important stainless steel lunch boxes are unless you like homemade dry foods and prefer carrying your own packed meals to work, school or trips. After all, isn’t it said that homemade food is tastier and healthier than food from food shops? You don’t need to tie everything separately; these containers have separate partitions for each food you intend to carry. Using these containers will, in the long run, save you money you’d have used on disposable food containers and the food from the cafeterias. They come in various quality standards and designs and like any other product and it can be complicated to choose the best stainless steel lunch container for you. So in this post, we have highlighted some of the areas you need to give thought to and some of the best stainless steel lunch containers available today. Read on to find out more. What to consider when buying stainless steel lunch containers? Why you need stainless steel lunch containers? You should have absolutely zero problems carrying your lunch every day with this container. They are perfect for kids who like carrying snacks and lunch to school, trips, and travel. It is built from premium quality 18/10 stainless steel that makes it tough and durable enough to make it through decades of use. The container is of a medium capacity measuring 6×5×1.75 inches (L×W×H) It has a 17 oz/ 500ml capacity, ample space to care for all your storage needs. 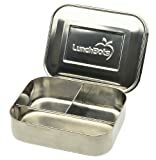 The container comes with a tight stainless steel lid that secures your food from being contaminated. The lid is however not watertight so you can only store dry foods. The market offers a Deux and Trois design which have different partitioning styles. An additional Simpo design lacks partitions. The materials used are non-plastic and BPA free making it safe for you and your family. While not overlooking quality, we must agree that the appealing looks of this unit are a big selling point. It is a stylish way of convincing your kid to carry and eat their food. You get three food containers that vary in size and are stackable and easy to store. This means that you have something for every occasion making this a practical option. The stainless steel construction is not only tough and durable but also food-safe and free from harmful chemicals. Do not worry as no funny tastes or odors will be introduced into the food by these containers. To prevent leaking and enhance durability, the company fitted silicone linings. This means you can carry wet food without having to worry about leaks and messes. They are perfect for school, work, holidays and trips. The company promises a full refund for dissatisfied buyers or defects. There are 2 vibrant color options to choose from. Meet this functional and stylish piece from LunchBots. The container measures 6” x 5” x 1.75″ and offers ample capacity to care for all your food storage needs. It is built from 18/8 stainless steel that makes this unit tough enough to make it through years of intense use. They come with colorful lids that lock away the food from contaminants. The lids are not water-tight o you should not store wet foods in the container. 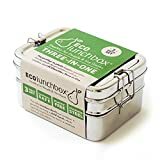 These lunch containers are generally portable and easy to carry and make a perfect choice for carrying sandwiches and wraps. You can put the container in the freezer to preserve your leftovers or stored food. The container and the lid are dishwasher safe. The materials used are eco-friendly and safe from harmful chemicals. With the 3 pieces of kitchenware that come with this package, all the sizes you’re likely to use are catered for. Expect to find a 16 Oz large container, 8 Oz medium container and a 5 Oz small container. Each piece is carefully crafted from 18/8 stainless steel making them tough and durable enough to stand up to everyday use. Each container has a corresponding non-toxic LDPE plastic lead that easily snaps into place to secure your food. Unfortunately, the lids are not leak proof so you will not be able to carry soups and stews. The units are easy to clean and when you are finished using them, simply throw them into a dishwasher. All these amazing features come at a highly affordable price point that makes this option well worth the sacrifice. The containers and lids are free from BPA, phthalates, PVC, and lead. The containers nest into each other to save you space during storage. Investing in a good set of lunch containers like this one will save you time and money while offering convenience. The set comes with 3 stainless steel containers, a lunch box and separate wet and dry containers to care for all your storage needs. The main lunch box is 4 inches wide, 5.5 inches long and 2.75 inches high and can accommodate about 4 cups of food. The is a compartment that is about 1.5 inches deep and can take about 1 ¾ cups of food, especially bulky food like chips, pasta or salads. The second lower partition is about an inch deep and contains about 1.5 cups of food. It is a decent option for kids and adults alike and it perfect for snacks, lunch, salads and desserts, pudding and more. The containers are dishwasher safe and easy to clean. We could not resist adding another product from LunchBots thanks to its supreme build quality, consistent delivery, and attractive looks. The makers used high quality 18/8 stainless steel to make the containers strong and ensure that it can withstand long years of serious abuse. You will get a 6” x 5” x 1.75” container with 3 sizeable compartments for separate storage of each food. 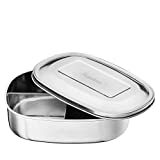 The tin comes with a lid that encloses your food and keeps it safe from any harm. You will love the part where the containers are designed pure and won’t add any tastes and smell to your sumptuous meal. The containers are still lightweight and easily portable so they won’t weigh you down. After using the container, simply put it into your dishwasher for easy cleaning. It is chemical free and safe for you and your family. The lids are beautifully decorated with different attractive colors to make the containers better-looking. LunchBots continues to cement its dominance in this niche with this convenient Bento Lunch Box. Stainless steel has been used for this lunch box making it long lasting and resistant to rust, scratches and wear and tear. We were impressed by the 5 compartments that allow you to separately store your variety of food without mixing. The container comes with an easy to use lid that secures your food and keeps away any contaminants. The lid is however not leaking free so you won’t be able to store soups and sauces. You can be sure that you and your family are harmful from harmful components. As you’d wish, the container lacks any smell or tastes so your food will retain the natural flavors and aroma. Monka did a wonderful job with this 3-piece set of food containers. Each container is made to last a lifetime from stainless steel. The large box measures 7.7X5.8X2.4 Inches, the medium box 6.9X5.0X2.1 Inches while the small box measures 6.1X4.2X1.6 Inches. Carry your delicious soups and sauces in these convenient tins thanks to their leak-proof construction. The pieces are lightweight and easy to carry around. After you are finished using the containers, just throw them in a dishwasher. The company stands by its product with a money back refund for dissatisfied buyers. Buyers get 60 free decorative stickers to express their mood. The components are BPA free and safe. Its LunchBots once more with an attractive and practical food container. 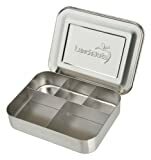 The tins are made of 18/8 stainless steel making them durable and resistant to wear and tear. It is still lightweight and easy to take with you. They come with lids for securing the food. It measures 6” x 5” x 1.75” inches with convenient partitions to accommodate a variety of delicacies. The materials used are eco-friendly and BPA free making them safe for the user. The company was also keen not to leave behind any smells or tastes that may affect the flavor of the food. Extra color options to choose from. Kids Conserve impresses with this handy lunch box for both kids and adults. The container is made of stainless steel lending to durability and resistance to breaking and rusting. The containers come with leak-proof leads meaning you don’t have to wait to get home before taking your favorite sauce or soup. Your food will be free from unfamiliar smells and tastes so you enjoy the natural flavors and aromas of your food. After using the container, you only need to put them in your dishwasher to clean. The materials are free from BPA and other harmful components. Oven Safety: Should you choose to use your container in the oven to reheat or cook food, you will need an oven-safe set. Ensure the option you settle for is labeled as oven safe. Dishwasher Safe: After enjoying that big meal, the last thing you want to do is clean the oily surfaces. Ensure the lunch container is easy to wash and dishwasher safe if possible. Price: It is undeniable that some have a bit more to spend than others, but this should not be to the detriment of quality. Choose affordable sets that are functional and long-lasting. Different brands cost differently but still offer the same great service. Warranty: A solid warranty is an important way to assure users of great craftsmanship. Make sure your pick is covered by a worthy warranty. The company should also be a reputable one with accessible contacts. 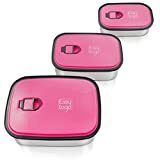 Safe food storage: These food containers come with lids that keep your food fully protected and safe from contaminants. They are economical: It is more economical to carry your own food than ordering food from cafés. Stainless steel lunch containers also save you the money you’d have otherwise used on disposable food containers. We are positive that this article will make your selection much easier whether you are a student or worker who carries or food or the adventurer exploring the outside. Go ahead and click at your preferred option from the ones we have listed and you will thank us later for the excellent performance.